With Titan Exteriors, You Know EXACTLY Who Is Showing Up To Work On Your Home. Here is a dirty little secret of the remodeling industry: many installation companies hire unskilled and untrained “daylaborers” to save on labor costs. In fact, most of your “big-box” retailers use third-party vendors to install their windows and siding – and you have no idea who is going to show up at your door. At Titan Exteriors, our installers are highly skilled craftsmen and direct employees. Our installation crews are direct employees of the company who have gone through an extensive background check and a rigorous training program. Why do we go to such extraordinary lengths? Because your home (and family) is just too important not to. We’ve been around long enough to know (and see) what can happen when your home’s siding or windows are not installed correctly. 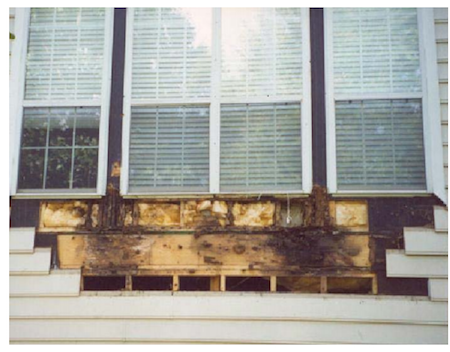 In fact, in one case that we know about, a faulty siding and window installation wound up costing the homeowners over $60,000 in dryrot and mold remediation and repair. Just take a look at this picture and you can see what can happen behind your siding… and the worst part? Because it is happening “behind the walls” where you can’t see it, by the time you realize there is a problem, the damage has been done. This is what can happen with less than expert installations. That is why at Titan Exteriors, we take as long as it takes, and we do whatever we have to do to make sure your job is done EXACTLY right. Bottom Line: Don’t trust your home or your wallet to just anyone. Call Titan Exterior today.